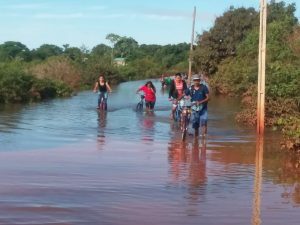 Rising flood waters in Lethem have forced the evacuation of 25 persons and the closure of several schools, a number of which were being used as shelters, authorities said Thursday. The flood is caused by heavy rainfall and overflowing Ireng and Takatu Rivers. 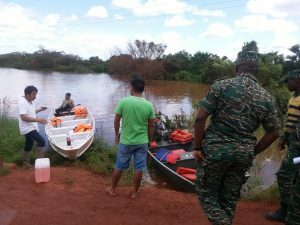 Director-General of Guyana’s Civil Defence Commission, Col. Kester Craig told Demerara Waves Online News that the evacuees are in three shelters as of Wednesday night. 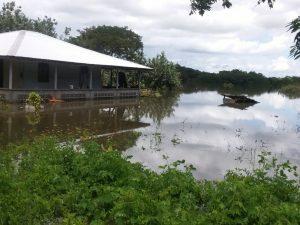 The Ministry of Education said the affected persons are being housed temporarily at Culvert City Primary School, Tabatinga Community Centre Ground and the Amerindian Hostel in Lethem. He added that the CDC was ready to rush relief supplies of food and medicine to the southern Guyanese town and its environs. “We are standby to do same almost immediately but waiting on the regional assessment report to determine quantity. Once we get that we will respond with supplies, I was promised the report today (Thursday),” he said. Craig said up to Wednesday the Region Nine administration “indicated that they can manage the current situation but if exacerbated, external support would be needed”. The Ministry of Education early Wednesday morning announced that it has accepted a recommendation by the Region Nine (Upper Takatu-Upper Essequibo) Emergency Operations Centre to close the St.Ignatius Primary, St. Ignatius Secondary, Arapaima Primary, Aprapaima Nursery and Culvert City Nursery schools. The ministry called on parents and guardians of children attending these schools are advised not to send their children to school.